Subscribe to our newsletter to receive exclusive news. 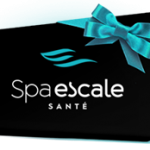 I wish to receive newsletters from Spa Escale Santé. By submitting this information, you agree to receive communications from Spa Escale Santé. I wish to unsubscribe from the newsletter.